BRON IN THE DON | Need some colour to spruce up the house or impress a would-be partner? Our London adventurer finds an opportunity on her London Top 100 list to stop and smell the flowers! Enjoy number 97. KNOWN for the freshest of fresh flowers, the Columbia Road markets are about a 15 minute walk from Old Street station located just inside the Tower Hamlets. We found them quite easy to find, as a stream of people carrying large bunches of flowers were walking in the opposite direction. As we got closer we heard the cockney accents (whether real or fake) calling out flower names and prices to shoppers and we knew we were in the right place. We threw ourselves amongst the throng of other market goers and jostled our way around looking at all the beautiful bouquets and potted prettiness. There were many different varieties from tulips to bamboo to cacti but from what you can see and smell, they were all gorgeous and fresh. They are also really cheap! With many stalls selling 3 bunches for a tenner or some other similar deal it was hard not to buy a whole stall – especially when a cheeky stall owner tells me that “lovely ladies would love some lilies”. However due to a pint glass being the closest thing I have to a vase I had to settle for only one small bunch of tulips. On either side of Columbia Road there are little shops that provide a brief refuge to the noise and hustle of the markets and also a great place to find some other individual gifts and home decor. One of my favourite places we stumbled across was RyanTown whose paper artwork and gifts I had seen through other shops in London. There was a shop selling antique china and another with garden tools but my favourite was the lolly shop. It was quite hard to resist buying everything in here too as they had gorgeous old vintage sweet tins filled with acid drops and other lollies. Towards the end of the road we found a bunch of musicians playing to the queue waiting in line for a take away coffee and pastry. We followed the crowd around the corner and found a smaller little market with food and clothing stalls as well as several interior design and furnishing stores. One find that I was absolutely thrilled with was the Lily Vanilli Bakery. Famous for her cupcakes (she has supplied Sir Elton John) this bakery is only open on Sundays and is well worth the wait in the queue that nearly wound its way back out the door. The bakery also sells lots of savoury treats as well as cupcakes and cakes so I treated myself to a savoury roll and a perfectly made latte which was the perfect perk up on a cold day. After visiting the bakery we wandered back through the markets having one last look at all the flowers before heading back down to Old Street. The markets themselves are fun but wouldn’t hold your attention for too long. However Shoreditch High Street and Liverpool Street are not too far away providing plenty of places to grab a bite to eat or drink. For me it was time to head home so I could pop my flowers in my pint glass to brighten up my room. 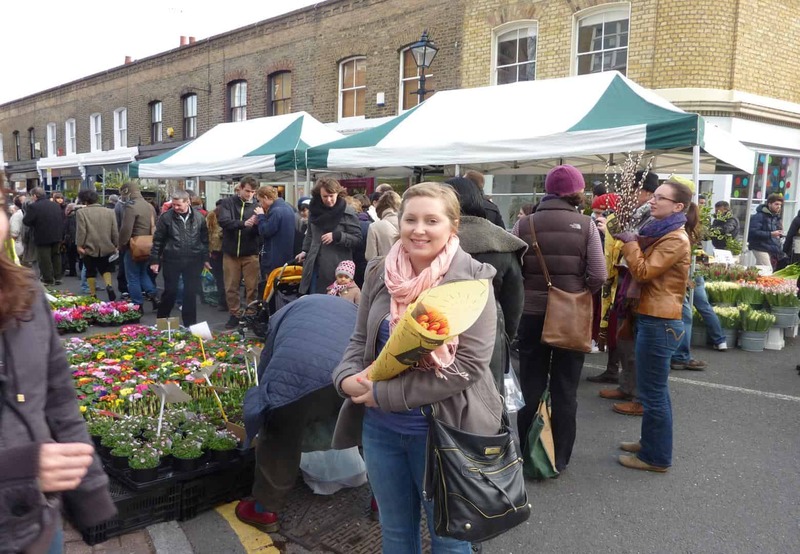 The Columbia Road flower markets are open on Sundays only, from 8am til 3pm.